We’d love your help. Let us know what’s wrong with this preview of Now or Never for Scaredy-Cats by Colleen M. Troy. Dying wisely is a new focus for middle-agers who want to know their lives have had meaning and they’ve made an impact in the world. 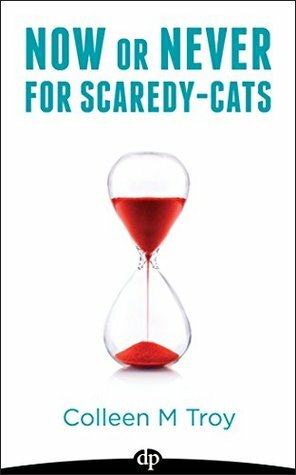 In Now or Never for Scaredy-Cats Colleen Troy shares compelling stories about what she has learned since she encountered this premise in The Tibetan Book of Living and Dying: if one is afraid to die, so is she afraid to live. Troy encourages o Dying wisely is a new focus for middle-agers who want to know their lives have had meaning and they’ve made an impact in the world. In Now or Never for Scaredy-Cats Colleen Troy shares compelling stories about what she has learned since she encountered this premise in The Tibetan Book of Living and Dying: if one is afraid to die, so is she afraid to live. Troy encourages other Scaredy-Cats to take responsibility now in their relationships, to come out from hiding, to break self-imposed and constricting rules, and to explore the landscapes of pleasure and joy. In the same vein as Elizabeth Gilbert’s Big Magic and Dr. Wayne Dyers’ Living an Inspired Life, Now or Never for Scaredy-Cats invites you to pull back the covers of your comfort zone to reveal what’s in your heart, so that on your deathbed, you don’t take your final breath being afraid of what you missed. • Why many people who want to experience more joy and play in their lives fail at doing so. • Critical steps to take for being responsible now in your relationships with others, with yourself, and with God – rather than waiting until death is near at hand. • How to nurture your dreams from your youth. • How breaking your own rules results in liberating your soul. • The difference between telling yourself you’re on a search for enlightenment about death and dying, and playing the game of “hide and seek” with your life. To ask other readers questions about Now or Never for Scaredy-Cats, please sign up. This 60-page book is about the current interest in discussing dying wisely. It's for middle-agers who want to know their lives have had meaning and they’ve made an impact in the world. If one is afraid to die, so is she afraid to live. But it's all really about life. The author encourages other Scaredy-Cats to take responsibility now in their relationships, to come out from hiding, to break self-imposed and constricting rules, and to explore the landscapes of pleasure and joy. Go for it! What a quick encouraging, insightful and simply a joy to get to the next page read! Ms. Troy is very brave to put her "get-out-of-my-own-way personal junk in print. Awesome! The ScaredyCat Pledges are worth passing along to everyone you know because they will resonate with anyone tiptoeing through life with a grudge of fear. It's a short, but Mojolicious read.